Get your Washington insurance license using an America’s Professor online training course. Our comprehensive video lectures, review questions and study guide will help you learn, and retain, the material needed to pass your Washington insurance license exam the first time! This is the second course I purchased and by far the best. Jack has real world examples to help with the courses "click". The videos had such great personality. I'm not a test taker, i get anxiety pretty bad. But I passed on the first try with flying colors. Thank you so much!!! America's Professor offers an excellent value. The course allowed me to go as fast as I wanted. I passed the WA state Property & Casualty exam scoring over 90%. I had no previous experience and logged only the minimum 40 hours of study time. Americas Professor was super fast to respond to my emails. I highly recommend Jack's courses. Passed L/D and P/C first time! It was easy to spot correct answers even with the different wording in the state exam. i took your advice and took exam right after course completion and completed test in about 1 hour! thanks again Jack!! I wanted to take a second and give a huge shout out to Pat!!!!!! he was such a saving grace during this process he was available for every question every late night phone call I had!!!!! the night before my test I started getting a ton of anxiety and he could hear it in my voice! at that time he told me to put the books up and go to bed! I was sooooo excited to call him after I PASSED!!!!! AP was very easy to follow. I took the state exam 3 months after finishing AP and passed with 86%. Format and examples make it easy to retain information. Thanks Jack! AP RESPONSE: Congrats on passing your exam! 3 months is a very long time to wait and retain the material (not recommended) so an 86% is a very high score. Nice job! I have to say that this course was a great one! I feel like I really got the most out of the pre course that I could possibly get. I finished the course on a Tuesday and took my State exam on a Wednesday and I passed. Jack made it very easy to understand and the customer service I received from Pat was great! Thank you America's Professor! I felt totally prepared and passed the test! The videos were helpful and the test quizzes and tests were great to give me an idea of what to study and what the questions would be like. Thank you Americas Professor! I took the exam and pass one time. What helped me the most were the ability to retake the quizzes and the readings for each chapter. I also like the review exams for life and disability, as well as the state law section. Jack makes even the most complicated topics of insurance interesting and fun to learn! I feel like I have not only learned everything to pass the exam with confidence, but I have also gained so much helpful knowledge about insurance in my life! Absolute professionalism in every aspect! Although the teaching and videos are superb and not at all convoluted, the customer service is THE most impressive aspect of America’s Professor! They even answered the phones over the Holiday season so I could complete the exam the day after Christmas which of course I passed - thanks to Jack and Nancy! Thanks everyone at AP!! The course layout is easy to navigate offering online text to follow with the video lectures, hard copies of the book, and a variety of section review questions. Watch the videos and complete the review questions multiple times. The day after I completed the course, I took the examination and passed with flying colors. I've already recommended this course to a fellow colleague. Many thanks! Our goal is for your educational experience to be a positive one! If you are dissatisfied with your course, please let us know as soon as possible. We will make it right. If you start the course and realize it’s just not for you, let us know and return the materials and we will provide a full refund. Refunds are not available after the course certificate of completion has been issued. Please also check our frequently asked questions about the Washington Insurance Licensing Exam. The key to passing your state insurance exam is knowledge. There are simply no shortcuts—you must know the material. This is where America’s Professor comes in. With decades of experience helping thousands of students across the U.S. prepare for their insurance licensing exams, AP has exam prep down to a science. Washington State differs from most as one must take an approved pre-licensing course and earn a certificate of completion prior to taking the state licensing exam. AP’s founder, Jack Morton, teaches the courses using humorous stories and straightforward examples, to help students make sense of (often dry) insurance terminology and complex in insurance concepts. In short, he makes learning fun! It’s why America’s Professor is one of the most highly rated insurance exam prep providers in the country today; see what our students have to say about AP’s courses. Prepare: Once you’ve decided which license you want to obtain, prepare for the exam by enrolling in a pre-licensing exam prep class through America’s Professor. AP courses include 24/7 access to our “better-than-live” video lectures online for 45 days (with extensions at no charge, if needed), a hard copy textbook, and unbeatable customer service. Pass: All states, including Washington, require you to be licensed to sell or discuss insurance. Additionally, each state has its own laws and regulations pertaining to insurance—this is why there are two parts to the exam: a state-specific section and a national section. America’s Professor courses prepare you for both parts. The great majority of our students pass their exam on the first try—a testament to the quality of our courses. Apply: Once you’ve passed your state licensing exam, you can formally apply for your insurance license and begin selling/discussing insurance! 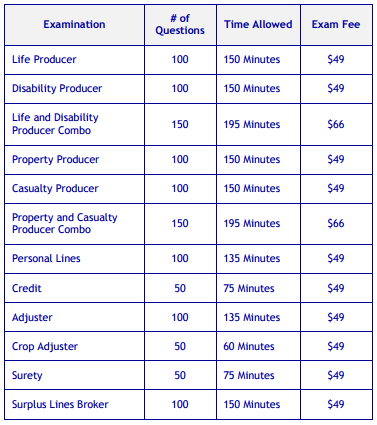 The state of Washington offers several different exams, including Life Producer, Property Producer, Casualty Producer, Personal Lines Adjuster, and others (see chart below). You’ll need a score of 70 on both parts of the exam—the state-specific section, and the national section—to pass. The two scores are not averaged together. Click here for more information on testing center locations, which tests are toughest, how the tests are administered, and other essential information. Test Registration: PSI Exams is the company that administers the insurance exams in Washington. Call the company at 1-800-733-9267 at least 3 days in advance of the date you wish to take the exam; calling in advance will help ensure you get the date and time of your choice. Testing Centers: There are several testing locations throughout the state of Washington, including centers in Arlington, Everett, Seattle, Tacoma, and Yakima. Refer to the “Where can I take the Washington insurance exam?” section of this page to see all test center locations in Washington. Fingerprinting: The state of Washington requires residents to have their fingerprints taken through MorphoTrust USA™ to obtain an insurance license; non-residents are not required to have fingerprints taken. You must make a fingerprint reservation no later than one business day prior to your desired exam date either by calling MorphoTrust USA™ at 866-761-8069, or at identogo.com. Read the section “What are the Washington Fingerprinting Requirements?” on this page for more information. Licensing Application Fees: The Washington State Office of the Insurance Commissioner charges a license application fee ranging from $25 to $205, depending on license type. View the fees for different license types here.